North Korea's leader said he wants to boost the "warm climate of reconciliation and dialogue" with South Korea after his high-level delegation returned from a visit to the South, as his foes reiterated the need to keep up maximum pressure and sanctions. Kim Jong Un gave instructions for measures aimed at more inter-Korean engagement after his younger sister Kim Yo Jong led a three-day visit to the Pyeongchang Winter Olympics, North Korea's state media reported on Tuesday. It did not specify what those instructions were. The United States has appeared to endorse deeper post-Olympics engagement between the two Koreas that could lead to talks between Pyongyang and Washington. South's President Moon Jae-in said on Tuesday the United States is open to talking with North Korea, Moon's spokesman told a briefing. "The United States sees inter-Korean dialogue in a positive light and has expressed its openness for talks with the North," Moon told Latvian President Raimonds Vējonis, according to the spokesman. US officials also want tough international sanctions to be ramped up to push North Korea to give up its nuclear programme. That sentiment was repeated by Japan's Prime Minister Shinzo Abe on Tuesday, who said Moon had agreed it was necessary to keep up maximum pressure on North Korea. Japanese officials took pains to stress there was no daylight between Japan, the United States and South Korea on their approach to dealing with North Korea. The United States' "fundamental policy" aimed at denuclearisation of the Korean peninsula has not changed, said a senior Japanese diplomat in a briefing to lawmakers. "The goal is denuclearisation and the process is dialogue for dialogue, action for action, so if North Korea does not show actions, the United States and Japan will not change their policies," he said. A senior military official stationed at the border between North and South Korea told Reuters North Korea has lowered the volume of its border propaganda broadcasts since the Olympics' opening ceremony on Feb. 9. "I still hear it, but it is much less than before," said the official who is stationed on the southern side of the border and spoke on condition of anonymity. Moon, who was offered a meeting with Kim Jong Un in Pyongyang via his sister, has been pushing for a diplomatic solution to the standoff over North Korea's nuclear and missile programmes. Seoul is planning to push ahead with its plans for reunions of family members separated by the 1950-53 Korean War in order to sustain the dialogue prompted by the North Korean delegation's visit. Meanwhile, Trump urged Russia to do more in urging North Korea to scrap its nuclear programme, the White House said on Monday, aimed at intensifying the pressure campaign on Pyongyang. Talk of an inter-Korean summit, which would be the first since 2007 if it happened, come after months of tension between Pyongyang, Seoul and Washington. As with North Korean media over the weekend, the KCNA report again made no mention of the summit offer made to Moon. 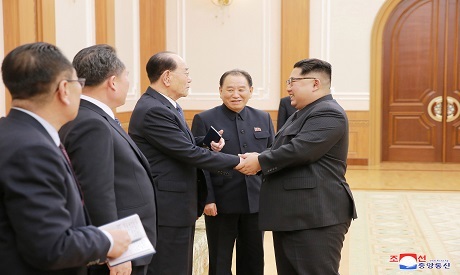 Rather, Kim Jong Un gave his gratitude to Seoul for their "sincere efforts" to prioritise the delegation's visit, which were "very impressive", KCNA said. Moon and his administration hosted several meetings and meals for the delegation during their stay at the presidential Blue House and luxury five-star hotels while Moon personally accompanied Kim Yo Jong for events at the Olympics as well as an orchestra concert. In addition to the high-level delegation, hundreds of North Koreans including an orchestra and cheer squad have visited South Korea for the Winter Olympics. The cheerleading team will be attendance at the united women's ice hockey team's final game in the Olympics on Wednesday, facing old rival Japan to conclude preliminary round play.